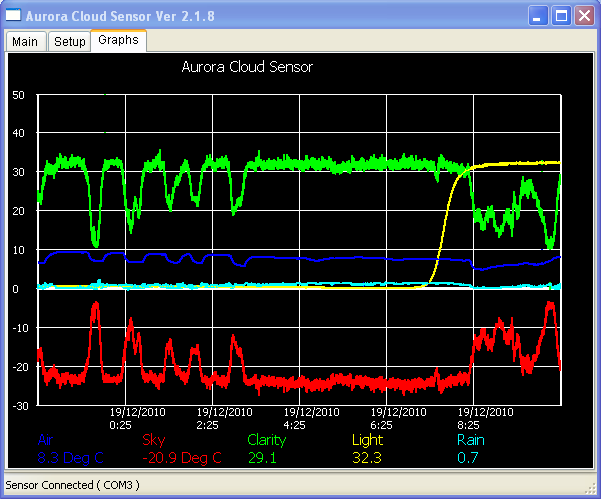 The Aurora Cloud Sensor III provides a low cost system for monitoring the sky for cloud cover / rain / snow and dawn / dusk. It is also ideal for monitoring for CLEAR skies. 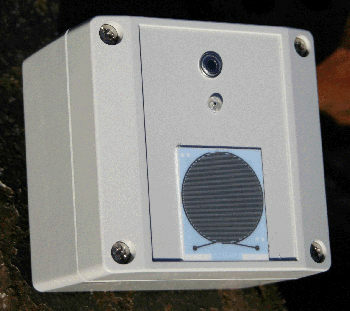 The Cloud Sensor III incorporates a relay suitable for closing the observatory dome or activating other equipment when cloud arrives. The relay operates independantly of the computer. The system comprises of sensors for cloud, rain, light and sensor temperature. The Cloud Sensor III also incorporates heaters to prevent false alerts due to dew / frost / light snow. * Sensors for cloud, rain, light and sensor temperature. * Suitable for use at rural and urban locations. * Built-in heaters to prevent false alerts from dew / frost / light snow. for different seasons and locations around the world. * Long term data logging, log files are suitable for importing into a spreadsheet (.csv). * Automatically uploads files & charts to a FTP server. when cloud arrives or to signal clear skies. * Remote data access over a network. * Power 12v DC, Power adapter available. * Supplied with 10m Cable and RS232/Power connectors fitted. We can supply shorter or longer cable (upto 100m) email for details. * Case is waterproof to International standard IP66. * Software and firmware upgradable (Via Internet). * Compatible with Windows XP, Windows Vista, Windows 7, Windows 8. (Both 32 and 64 Bit versions). * We can produce custom or OEM versions of our Aurora Cloud Sensor III. How does the Aurora Cloud Sensor work? 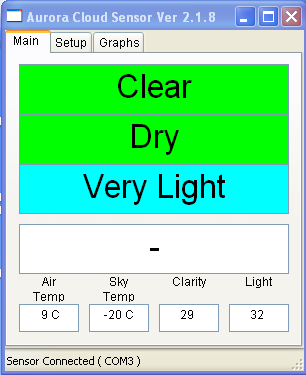 This system works by comparing the sky temperature with the air temperature. Under clear skies the system senses the upper atmosphere temperature (which is very cold). However if the sky is cloudy the sky temperature is only slightly colder than the air temperature. The system also has sensors for rain and light. * All our products are CE appoved for sale within Europe. 1) Non EU Customers. You will be responsible for Customs Clearance and possibly Import Duty. 3) You will not forward the items to one of the countries listed above.